Hello Paul, and welcome to The Poetry Zone Interview. First question. Did you always want to be a poet? No. At school I wanted to be a footballer or a pop star. I still follow the progress of Everton (or their lack of it ) today. They’re not doing too badly at the moment. So – Who were your favourite pop group ? SLADE! Still are. Noddy Holder is one of the greatest singers ever! I still like all the 70’s stuff as well – Sweet, Mud, Rubettes, Showaddywaddy – great fun! What music do you listen to today ? Turn that racket down! Are you going deaf? Turn that racket down! I’m trying to concentrate! Turn that racket down! Do you call that music? Turn that racket down! It’s making my head ache! Turn that racket down! I can’t hear myself think! Turn that racket down! It all sounds the same! Turn that racket down! They can hear me down the street! Turn that racket down! It’s driving me insane! I need to get this done! Can’t you see I’m trying to work? It sends me round the bend! Switch that music off right now! You know it drives me mad! So… TURN THAT RACKET DOWN, DAD! Roger McGough, John Cooper Clarke, Brian Patten … there were a couple of small books by Steve Turner and Simon Jenkins which made me want to do my own little book. When I was 18 I made a little pamphlet-type of thing called Growing Older Soon which I sold to friends for 50p. Shortly after that I did a couple of books with a schoolmate – Cliff Woodcock, who did some fantastic artwork. Whose poetry do you read most now? Thank you. I expect you read a lot, too. Have you always been a poet? 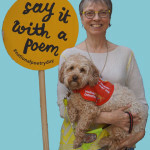 I trained and worked as a full time teacher for five years – although I’ve always written poems – and then in 1989, I decided to go part time and work as a poet in schools. Now I visit 3 or 4 schools every week although I still teach on Wednesdays. When and where do you write your poems? If I’m not in schools I may spend time at home writing. Usually, I write in trains, hotel rooms, staff rooms – here, there and everywhere, often in short bursts, adding to ideas over a period of time. Once I’ve drafted them and tried them out a few times with kids to get the feel of the poem I’ll type them up and test drive them in performances, sometimes changing bits here and there. Then went and kissed my dad. How many poems have you written? Thousands – but not all of them good! Some are not that special when you look back. Often I’m writing poems “to order” to fit someone’s anthology so I might be writing about a certain subject – it’s like doing your poetry homework, and like homework, as the deadline approaches you don’t always do your best work. Consequently, some poems aren’t as thought out as they should be. What does happen though is that the good ones do filter through and have a life of their own. I’ve just begun work on my first book as an editor – but you’re an old hand. When did you start? I’d had a few poems accepted by David Orme for his first football book – ‘Ere We Go ! – and then for his monster anthology – Dracula’s Auntie Ruthless – and thought that I must be doing something right. So I came up with a few ideas for anthologies and sent them to David – he sent them back and suggested that I send them to Macmillan. I did just that and eventually had one accepted … then another … and a few others. Now, I probably do at least 3 or 4 titles a year for them. Also, I’ve just done a couple for Red Fox books and Lion Books have just published a solo collection. It’s just snowballed this last four or five years … and long may it continue to do so ! Paul’s solo collection for Lion Books. Tell us about the process of editing an anthology. First of all once I’ve got the idea or theme accepted I send a request letter out to lots of poets (I have about 200 names and addresses) asking them to submit poems about the subject and send them to me by a certain date. It’s a bit like setting poetry homework! Once all the poems are in I have to read through them all and select the poems for the book. It’s strange in that it’s not just the best poems that get in, it’s got to be a balanced selection – short, long, rhyming, non-rhyming, funny, thoughtful, male and female poets, male and female voices – all these aspects can play a part. Next I work with my editor at the publishers and we finalise the selection then it’s a case of writing to the poets to ask their permission and offer them a fee for their work. After that, I hand it over to the publisher who then commissions artwork etc. and finally wait for it all to come together. Which has been the most successful anthology? The Works, published by Macmillan’s Children’s Books, has sold more than any of the others. Which is your favourite book or anthology of your own? Usually the one that’s just come out. My favourite collection of my own poems would have to be Father’s Hands, because the poems are much more personal. Macmillan’s The Very Best Of … is also up there, for obvious reasons. What about favourite poems of your own? Again, too many to mention. 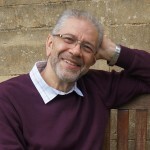 There are about 25 poems that I regularly perform in primary schools and the same again for secondary schools and because many of those have stood the test of time, then they are favourites. Then again, I come back to old poems after a while and it’s like discovering an old friend, or new poems come along and jostle for attention. Also it depends what sort of mood I’m in ! Mum Used Prittstick, Captain Concorde, The Toilet Seat has Teeth ! The Salmon With a Hat On, Father’s Hands … are all firm favourites that I’ll always perform. Are there any poems you wish you’d written? David Harmer’s Mr. Moore – great chorus, very simple but superbly effective. Henry Normal’s Drinker’s Prayer, John Cooper Clarke’s Beezley Street, and Haiku … mind you I have adopted them and regularly perform the first two. Also I have written a poem of my own that has the same rhythm and repetitive pattern as Beezley Street called The School That Time Forgot. Every time I read a new poem that I like there’s part of me that thinks I wish I’d thought of that! What advice would you give to any aspiring poets? 1. Read as much poetry as you can, even stuff you don’t think you’ll like, as many styles and genres as possible. 2. 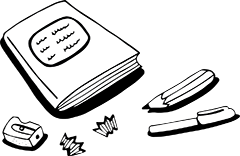 Write as much poetry as you can – copy styles and genres, set yourself targets – write a funny poem, a sad poem, a rhyming or non-rhyming poem … experiment with different styles and voices. 3. Read out your poems – to yourself, to friends, to your class … get the feel of the words. The sound of the words will often give you ideas regarding repetition, rhythm etc. Poems are written for the voice and the ears – learn them, get to know them. Also, you will know as you read them out loud whether they work or not. If they don’t, don’t be precious, be honest – go back and rework them. Your only limit is the sky. Do you write other things? I started writing poetry for adults, I still write a lot of poems that are more adult – in that they are about things that happened to me when I was growing up so that the reference points are more appropriate to people of my own age. In fact I have at least two collections of adult work that has been consistently rejected (18 times so far). The working title for one of them is THE GLAM ROCK FOOTBALL LOVE POEMS – all about slade, football, growing up etc. I’ve also had a couple of ideas for novels, one for kids and one for adults. I’ve got as far as working out the plots and that’s about it, although I have done a couple of chapters in rough for the children’s one. If you could have one wish about your writing what would it be? I’d like the time to develop all the ideas I have. I never get chance to explore fully all the ideas I’d like to so I suppose my wish would be to get a large advance of money which would mean that I could have the time and security to write. Have you ever been on the telly? Yes. My mum said “Get off you’ll break it !” Actually, I did a programme for schools called Middle English, where I had to write a poem about an elephant at London Zoo. Also, I work with a poet called David Harmer in a poetry double act called SPILL THE BEANS and we wrote and performed in a BBC children’s programme called WHAM BAM STRAWBERRY JAM! a couple of years ago. What exactly is Spill The Beans? Spill The Beans began 10 years ago when Dave Harmer and myself got together. We perform poems as a duo with the dynamics of two voices, two characters etc. There’s lots of audience participation and fun – it’s more like a poetry pantomime in atmosphere than a poetry reading. It’s great fun. I don’t get recognised in the street. I don’t feel famous because I’ve visited schools for the last 12 or so years so I’ve always done that, but now that the books are becoming more popular it seems strange to be getting requests from all over the place to do stuff where more people have obviously seen the books. I’ve just been invited to go to Singapore for a week in 2002 – the last person they had was Brian Patten, so that’s pretty good company. A kid in Doncaster once asked for my autograph and then said “Thanks. I’ll put that up on my wall next to my picture of Fred Dibnah” (old Lancastrian steam engine enthusiast ) – which was bizarre. What spare time ? I fill in questionnaires like this ! Play 5 a side football, read, listen to cds – but not all at the same time! and discussed at length by intellectuals. exactly what you’re feeling this very minute. That stuff with all the white space round the edges. The best possible words in the best possible order. Words on a page that you may or may not like. Performance poetry is like ordinary language but turned up a bit. I like the idea that anyone can write poems and that often the best ideas are the simplest ones where you think “why didn’t I think of that ?” I don’t like the pretentiousness and artiness of some poetry where it is thought to be better and somehow more valuable because it’s written by someone who’s dead or it’s about something deep and meaningful. I hate the attitude of some editors and poets who think that modern poetry for children is rubbish, throwaway or disposable and therefore not real poetry because it contains jokes or bad puns or whatever. That’s just intellectual snobbery and closed mindedness and those people are obviously far too precious about it. Poetry is about words that you like – for whatever reason. The great thing about poetry is that it can be everything you want in writing covering every emotion. I love it ! 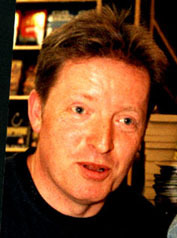 Turn that Racket Down is from Turn that Racket Down, Pop-tastic Poetry chosen by Paul Cookson (Red Fox). Mum Used Prittstick, Let No One Steal Your Dreams and the beginning of Poetry So Ordinary are all from The Very Best of Paul Cookson (Macmillan Children’s Books). This interview’s a bit old now. But you can get right up to date by going to Paul’s website.